Did you know? Culture plays such an important role in a diet (food, in general, is what I mean here). Besides having unique body mechanisms, we thrive on food habits developed over the years. Of course, some of these habits need to be undone, as they affect our well-being, but eating a cultural staple, as part of our food, is integral for sustainability. For instance, if your parents fed you too much sugar and you’re insulin resistant now? You know you need to cut it down. So, what I really mean is that your cuisine can be customized into your dietary needs. We crave foods from our childhood or remember them very often. Having had clients from various nationalities such as India, Australia, England, Lebanon, Bahrain, UAE, Egypt, Philippines, South Africa, France, and Serbia… I’ve seen that often. I must say, I’ve loved and enjoyed customizing food options for each one. It’s OK to enjoy different cuisines but in the long-term, we crave foods that we’ve grown up eating. I remember giving my first talk and having talked about my own culture and what I grew up eating. I also talked about why I choose to eat vegan and why. However, if I were to give my food to someone who grew up eating meat and fish and all kinds of nonvegetarian food, not only will it be unpalatable but also NOT SUSTAINABLE. Healthy eating needs to be sustainable. Unless there is something drastically wrong with our body mechanism, we can eat right and healthy as per our culture. When we need to or at least choose to adopt a healthy lifestyle, it is crucial include our food preferences… make changes based on cultures and of course medical conditions (if any), to be able to sustain a long-term healthy lifestyle. As much as our body needs movement, more than that it needs proper nourishment, which comes from the right kind of customized food nutrition?. Today, more than ever in our society, we need to eat right to prevent diseases and nourish our mind body and soul. This can only happen when we understand what is our body actually craving and how can we nourish it. Listen to the show-tell-signs and make simple changes. By the way, this food on top is my staple food. 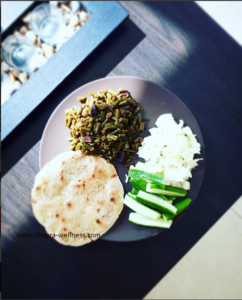 I love my Indian roti (bread), sabzi (vegetables), dal (lentils) and chawal (rice). I eat it almost every single day. I love it.?? We simply need to eat the right ingredient for our body and in the right proportion. Everything else will fall in place. Trust me, when I say this. Tell me: Do you know how to eat right for your body and as per your culture? Ask me questions, if you have so that I can help you. ← Why do you need a health goal? And what does that even mean?